Update: Application deadline has been extended! Applications are now being accepted on a rolling basis. Travel and expenses related to the workshop will be covered for the 20 workshop participants as part of an NSF-funded IUSE grant. This workshop will train instructors in the use of the Avida-ED software package, developed to help students learn about evolution and the nature of science, so that workshop participants can both implement classroom interventions using this software and also train other educators. Teams of two will learn to use Avida-ED and how to best incorporate it into courses that they teach. This year, we are offering two summer workshop options: one June 12-14, 2019 at the University of Texas in Austin, TX; the other August 7-9, 2019 at Michigan State University, in East Lansing, MI. For more information go to our Active LENS Workshop page. 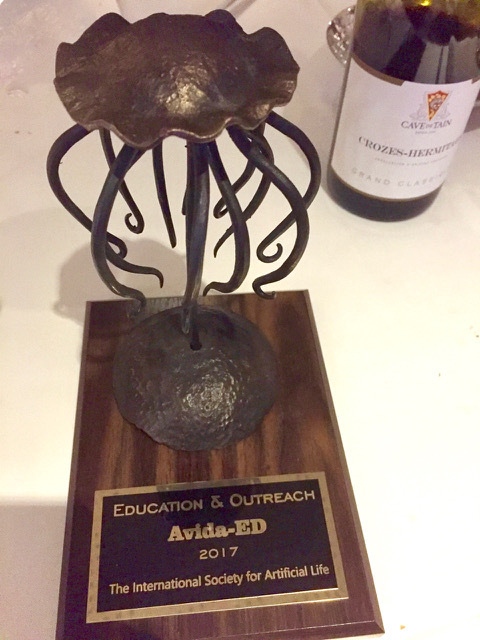 Avida-ED was the 2017 winner of the International Society for Artificial Life (ISAL) Education and Outreach Award. The award was announced at the Artificial Life conference, which was held September 4-8 in Lyon, France. Congratulations to everyone who has worked on the Avida-ED project over the years! 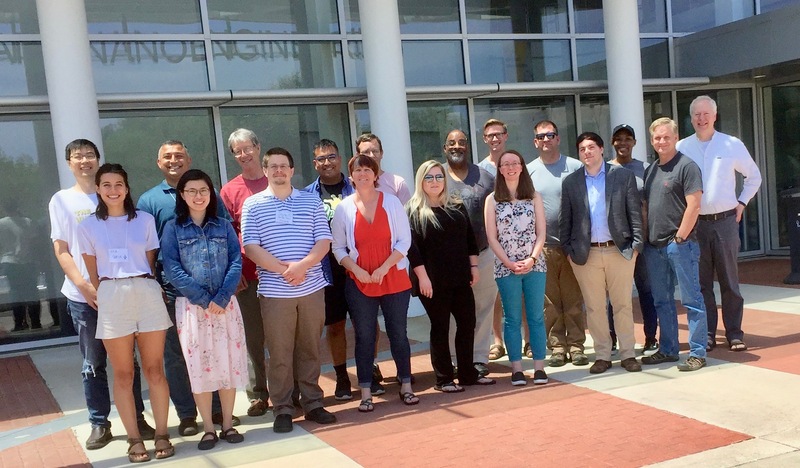 • June 2018: The fifth national Avida-ED Active LENS Workshop for faculty was held at the North Carolina A&T campus in Greensboro. 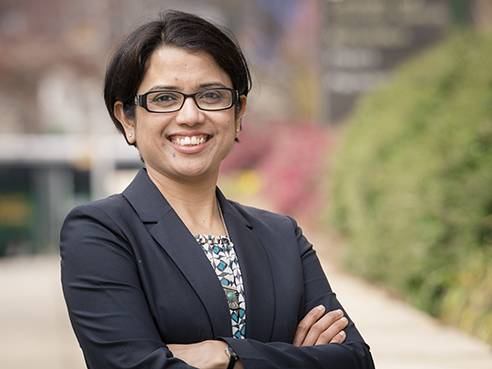 • August 2018: The sixth national Avida-ED Active LENS Workshop for faculty was held at the Michigan State University campus in East Lansing. • Active LENS participant Sami Raut taught an Avida-ED workshop in India, increasing Avida-ED’s use internationally. 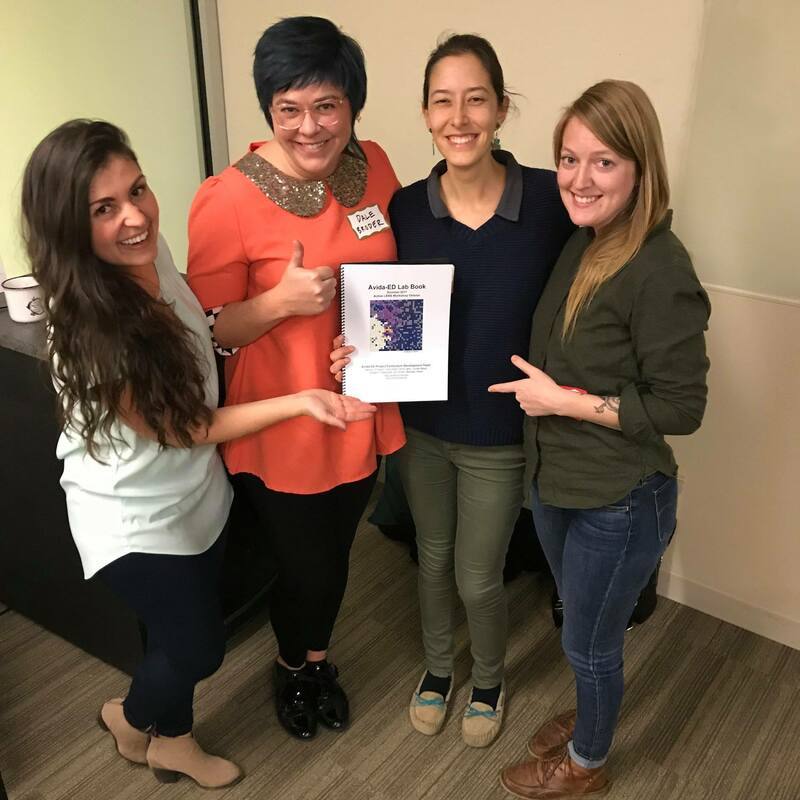 • Whitley Lehto, Mayra Vidal, Gabby Gurule-Small, and Dale Broder taught an introduction to Avida-ED digital evolution software (developed at BEACON) at a regional conference, The Front Range Ecology Symposium, in Fort Collins CO. Many of the attendees have ideas for how to include Avida-ED activities in their classes. • Mike Wiser, Kohn C, Mead LS, Smith JJ, and Pennock RT. “Undergraduate Student Conceptions About Randomness and Mutation.” Poster at SABER. July 21-23, 2017. • Mike Wiser. Undergraduate Student Conceptions About Randomness and Mutation” Poster at Evolution 2017. June 23-28. • Louise Mead. “Avida-ED Implementation at MSU: Past, Present, and Future.” HHMI Gateway Summit. Michigan State University (May 16th, 2017). • Demo of Avida-ED running at the BEACON Booth at National Association of Biology Teachers (NABT) meeting in November 2016. • James J. Smith. “Using Evo-ED cases and Avida-ED digital evolution as integrative, active-learning approaches to evolution education”, Invited seminar, University of Guelph, CBS Office of Educational Scholarship and Practice, November 15, 2016. • James J. Smith. Professional development session on Avida-ED for four high school teachers at the American School in Barcelona in October 2016. 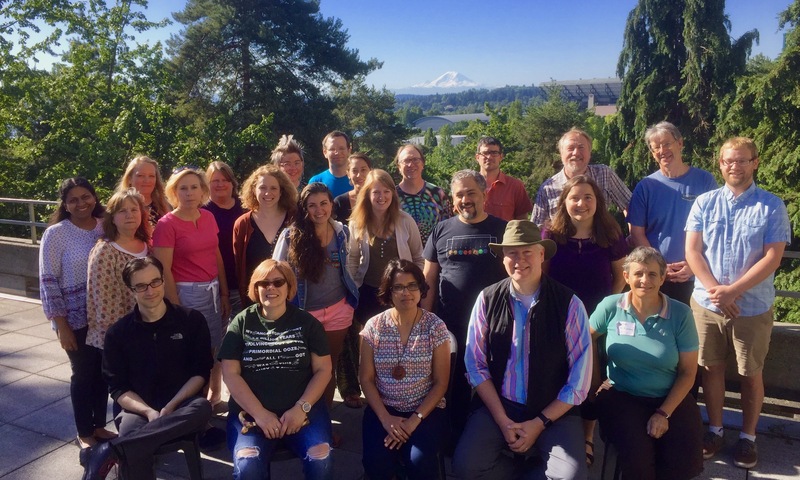 • June 21-23, 2017: The third national Avida-ED Active LENS Workshop for faculty was held at the BEACON Center for the Study of Evolution in Action at the University of Washington in Seattle. 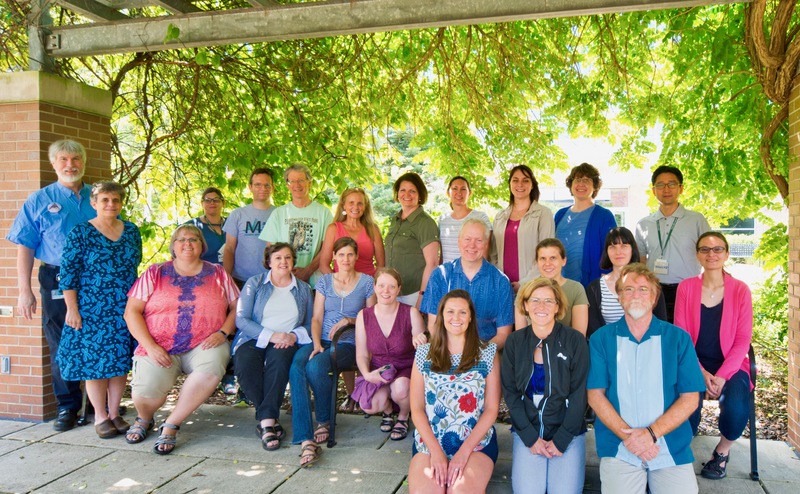 • July 27-29, 2017: The fourth national Avida-ED Active LENS Workshop for faculty was held at the Michigan State University campus. in a national study of classroom use of Avida-ED. 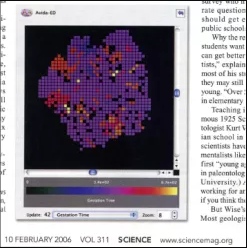 Avida-ED is discussed in the 10 Feb. 2006 issue of Science. 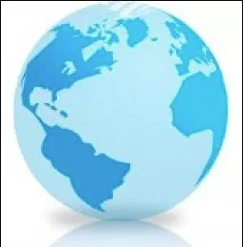 Avida-ED has been used in biology classes in universities and colleges such as Arizona State, Cornell, Grinnel, Harvard, North Carolina A&T, Univ. of Texas, Univ. of Washington, Univ. of Wisconsin-Madison and many more. 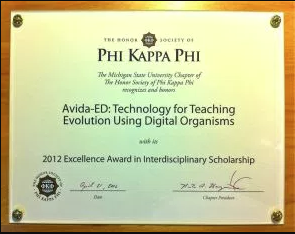 Avida-ED won the 2012 Excellence Award in Interdisciplinary Scholarship given by the MSU Phi Kappa Phi Honor Society.